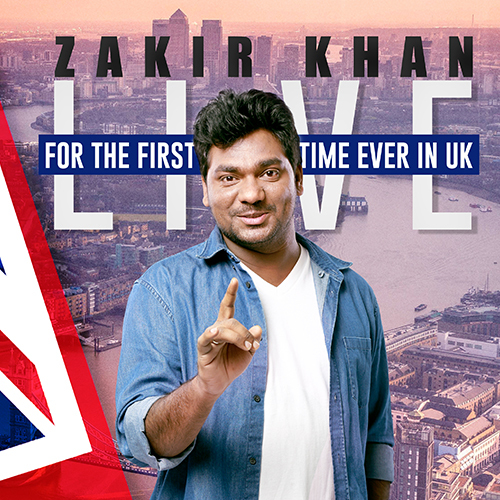 Watch Zakir Khan perform live in the UK for the first time ever! A cartoon by heart, comedian by nature, a writer by profession and performer by birth, Zakir is the winner of Comedy Central's hunt for ‘Best Stand Up Comic of India’. His name is Khan (from the epiglottis) but he is certainly not a terrorist. This 'Confused Desi' serves up his take on modern India with a hard-to-resist rustic humor that'll have you nodding your heads and clapping as you relate to everything he says. He can smoothly switch modes for an audience full of family members, a corporate crowd or a room full of men. Each show will know him as a different Zakir. © 2019 Ticketbooth Europe. All sales are final. Tickets are non-refundable.